Nathan Danilowicz’s practice inquires at the intersection of art and mysticism. It is an exploration of high and low culture, the occult, and alternate realities– how mortality compliments growth and is made tactile in works that pull references from minimalism, sci-fi shamanism, and ritual. Combining highly crafted geometry with raw gestural accentuation, Danilowicz creates works that are an alchemical marriage of intuitive exploration and honed precision. Insistently contemporary, Danilowicz’s work nevertheless recalls the geometric abstraction of late modernism, and reflects the fractured psychologies that have arisen in the midst of our dystopian techno-isolation. The core of Danilowicz’s practice begins with small ink drawings that he refers to as Quaternities. For Danilowicz, these daily drawings act like mandalas. In this instance, the act of creation is a means to harness both mental acuity and release. To date, Danilowicz has completed over 1300 of these geometric drawings. It is from these essential works that all of his additional artworks, whether they be paintings, sculpture, or of another medium, stem. Shadowkings is an exploration of the (hidden) power influences that co-mingle throughout society. Using Chaos Magick as a central interest, Danilowicz enacts his will onto the world through painting and sculpture. Like the many intersecting lines that adorn Danilowicz’s work, the numerous exchanges between artist and viewer make palpable the specter of eternity in all its abstraction. Using found materials, such as wood, plastic, and metal, Danilowicz’s sculptures reference urban decay and renewal. They strike an uneasy equilibrium as they are at odds with their own being, at once in a state of becoming and unbecoming. In Danilowicz’s work, the cosmetic cover of reality is bled to the surface with no resolution offered. It is in these types of psychic places and embodied movements that the artist calls to attention the modes of perception, and the liminal space between unknowing and understanding. NATHAN DANILOWICZ (b. 1980 Pennsylvania, USA) received his MFA from the University of California, Los Angeles in 2007, and a BFA from the Maryland Institute, College of Art in 2002. A MacDowell Colony Fellow (2009), he has exhibited nationally and internationally. 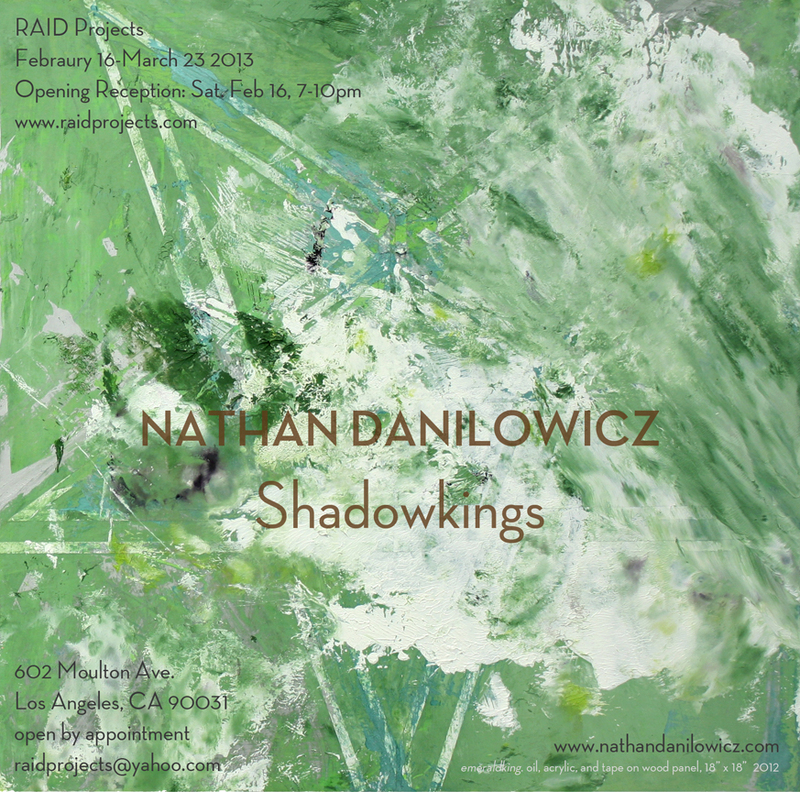 Solo exhibitions include Latned Atsär in Los Angeles (2011), Crisp London/Los Angeles (2008 and 2009/2010) and the H. Lewis Gallery in Baltimore (2004). His numerous group exhibitions include shows the Hammer Museum, Torrance Art Museum, Cal State University’s Luckman Gallery, Los Angeles Contemporary Exhibitions, The Santa Monica Museum of Art, Cirrus Gallery, Telic Arts Exchange, Raid Projects, Eighth Veil, 533 Gallery, Parendo Blanco, S1F Gallery, Bonelli Contemporary, Wonderloch Kellerland, Art Platform, and Art LA Contemporary in Los Angeles; Locust Projects and TwentyTwenty Projects in Miami; Hilary Crisp, OK By Gallery, and the Zoo Art Fair in London; EYEHEART, Local Projects, and The Hose in New York; Lust Gallery in Vienna; Galerie Françoise E.S.F in Baltimore; The Green Gallery East in Milwaukee; Queen’s Nails Annex at the Waypoint in Marfa, TX; and The Luggage Store gallery in San Francisco. He has written for artUS magazine, and his work has appeared in The New York Times, TimeOut London, Miami New Times, The Baltimore Sun, Baltimore’s City Paper, DIAGRAM, Penny Ante, PRISM Index, and Beautiful Decay. While at UCLA, Danilowicz studied New Genres under Chris Burden, Jennifer Bolande, Andrea Fraser, Donn Suggs, Lari Pittman, Charles Ray, Mary Kelly, Roger Herman, Jeffrey Vallance, and John Baldessari. While at the Maryland Institute, College of Art, he studied art history and theory under T.J. Demos as well as poetry under John Yau. He has worked as a studio assistant for Jason Rhoades and later for Mike Kelley. More recently, he has collaborated on text/image projects with writer and theorist Lawrence Rickels as well as fiction writer and translator Brian Evenson.